Proulx writes with irony, dark humor and unadorned candor about quirky, snarled humans and the Wyoming wilderness they try to tame. Her unvarnished writing style melds perfectly with the sparse terrain and flawed humans she writes into being. I admire the mastery with which Proulx crafts a simile because I’m frustrated when authors overuse them or ‘force’ them, resulting in awkward distractions in flow and meaning. Proulx’s similes are story-centric, drawn from the very landscape in which her stories occur. The following is from ‘Them Old Cowboy Songs’ in her third collection. We all have our ‘Six Degrees of Separation-ish’ moments, and I’ve had mine with Proulx. Years ago when I worked for an investment firm, I hired an art consultant Tina S to help me select art for our offices. I worked with Tina for several months on the project and enjoyed the time she spent with me. 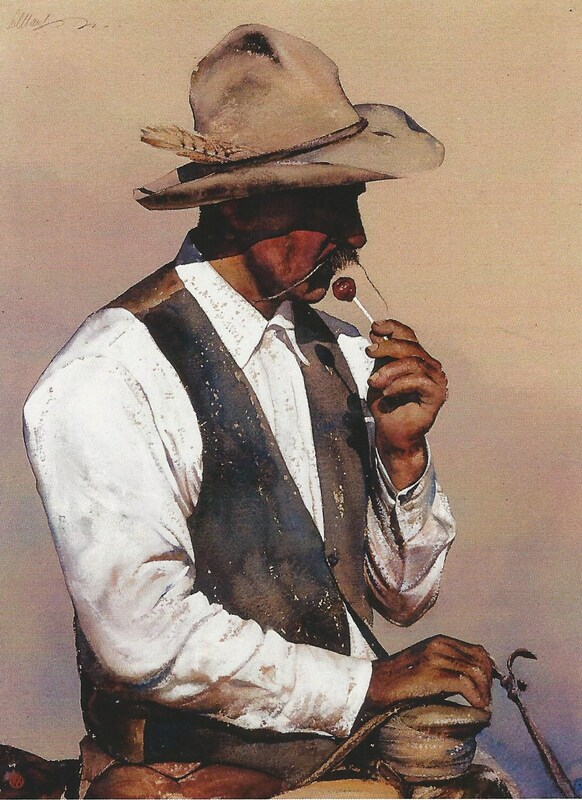 A number of years later, I became aware of a watercolorist named William Matthews specializing in Western art . I loved his paintings, and found out he lived and worked in Denver. When I visited his gallery, I was greeted by none other than Tina S who left the consulting firm to manage Matthews’ gallery. 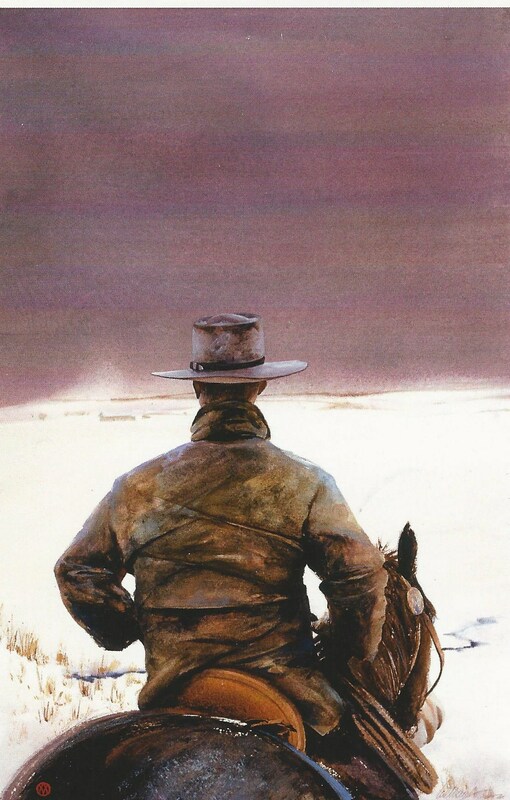 When I thumbed through Close Range: Wyoming Stories on the shelf at the library, I discovered that Annie Proulx had collaborated with Matthews to insert replicas of some of his paintings into her book. It was for this reason I decided to read Proulx’s book. My love for Matthews’ paintings deepened as Proulx’s descriptive writing gave me new perspective for the people and landscape in his paintings. Last November, Hub and I visited the Denver Art Museum where we discovered Mathews’ one-man retrospective, Trespassing, had just opened. I was in the early planning stages of my Annie Project and, although I can’t afford his paintings, I bought postcards to scan into this post about Proulx. 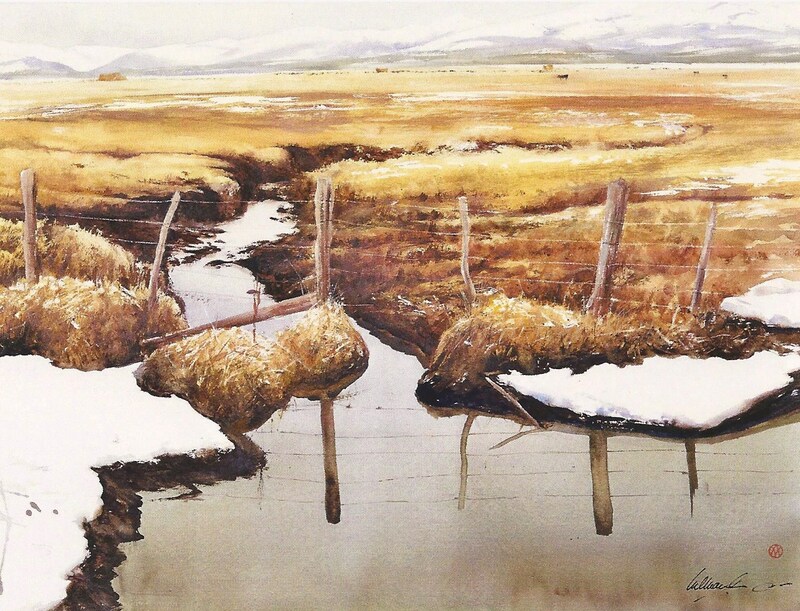 My scans don’t do his paintings justice – his muted landscape colors mirror exactly the Wyoming grays, golds and purples of sunsets and winter skies. His shirts and jackets look real enough to touch, each crease and fold ‘just so’ as if the men on horseback were right in front of us. During my mention of Proulx in a previous post Linda, an exquisite writer who blogs at The Task at Hand, commented she kept a copy of a Proulx story published long ago in the New Yorker magazine. Linda sent me a link to this photo by Nebraska photographer Soloman Butcher from which an edited version accompanied Proulx’s story in the magazine. I met Linda through Almost Iowa (another five-star blogger). I’m grateful not only because I savor Linda’s writing, but because she introduced me to photographer Solomon Butcher whose Nebraska history is fascinating. I plan to research and write about him for part of my Western-themed series. These so-called ‘six degrees (more or less)’ that bind us to each other are one of my most joyful discoveries when combining reading, art and research with my blogging community. To circle back to Annie Proulx, I have one more of her books to read, a memoir titled Bird Cloud in which she recounts how she and her husband acquired 640 acres of Wyoming wetlands and prairie along the North Platte River from the Nature Conservancy and designed and constructed the home they now inhabit. In a final ‘six degrees’ twist, Nature Conservancy was one of the first organizations I supported when I moved to Boulder, and my brother now works for the Nature Conservancy in Michigan. Everywhere I seek, I find connection. It’s my reward for conscious living. You talk about your appreciation for an author’s mastery of turning a phrase (in this case a simile), but I would say you’re very talented as well. I love the metaphors you use for how they write! Thank you, Libby. How nice of you to take time to read and give me your thoughts! I am not familiar with William Matthews, but I am glad to see his work. The depth of that sky, and yes, look at that white shirt — realistic indeed. I loved The Shipping News, (even the movie was pretty good) and because of that book, I tried to read another one of Proulx’s books, but I didn’t love it, gave up, and now I don’t recall much of it. Thanks, Joey. I think there must be something about regional fiction writers. Some we fall right into because it’s ‘our place’ and others – as well as they write – might not reach us with their stories. I always feel lucky if I develop an affinity for an author despite foreign (to me) settings. As you might remember, Shipping News didn’t appeal to me! I most heartily agree with Joanne above. This post deserves wide readership. Well done. And thanks for the news about Proulx’s memoir… I will have to seek that title. Thank you, Maggie. You make me feel good about this post! I’m itching to start all 10 books in my ‘pile’ and keep thumbing them all as if I can multi-read !! I think I’ll save Proulx’s for this fall, although I don’t know what time of year her memoir takes place. Wyoming, however, is an autumn kind of place for me. I will have to check Ann Proulx out. I love Wyoming, most of all its eastern desolate parts. There is something in my nature that wants to put a horizon between me and everything else. As for Wyoming, the best reading I have come across about the place is Basin and Range by John McPhee. Oh, how I wish I could write like him. I love the way you put this, and I think it is the ‘jog’ I needed to get one of my thoughts into a coherent future post. Thanks! I am going to look for works by the author you mention; I always like checking out what my blogging buddies are reading and raving about. I don’t know if you will like Proulx’s stories, but her techniques and style should appeal to you. My favorite collection, overall, is the second series, Bad Dirt. However I couldn’t stop thinking YOU might have written The Sagebrush Kid, a ghoulish tale in her third collection. It wasn’t all that long ago I said to someone that I wished I could be John McPhee when I grow up. Actually, I’d be happy to be one-tenth John McPhee. One one-hundreth. I met him through his writing on the Atchafalaya Basin during the last terrible Mississippi flood. I was completely entranced. Read “The Pine Barrens,” and you’ll never think of New Jersey in the same way again. Coincidentally, McPhee’s name popped up in a recent article by Dinty Moore, a ‘creative nonfiction’, guru. I’m researching that fascinating topic and hoping to write a few pieces about the genre itself. Thanks for McPhee book title. Thank goodness for librairies and used book markets! And yet another author I haven’t read. Sigh. But at least I’ve now experienced her through your eyes. I agree about similes. They can be tricky, and overdoing or overforcing them is distracting to the reader. It’s also a great way to get dinged by reviewers. If we write cheesy similes, they’ll pick up on them, and that’s usually what they’ll use as an example in their review. Yikes. As for reviews and similes, it is probably cringe-inducing to read that from a reviewer. (and I don’t recall thinking that while enjoying your book). But I have to say, it is one of my chief nits, and I see poor or ill-placed similes in many ‘first’ fiction authors. Similes seem like a no-brainer, so I wonder if writers actually practice them and study the technique. It really does break rhythm and tone when they are ill-timed. Sort of like hitting the wrong note or being off-beat with a musical instrument. Now I need to practice them so I don’t put my foot in my mouth!! Luckily I’ve not yet had a reviewer tweeze out one of my similes and poke fun of it. I try to keep them to a minimum and make sure they work! Those teens – 35 seems old to them! Hub came home yesterday to tell me about an older man at the golf course. He was 75. i didn’t have the heart to remind Hub he’s not too far from that number himself! Yes, it’s amazing how relative age is the older we get. 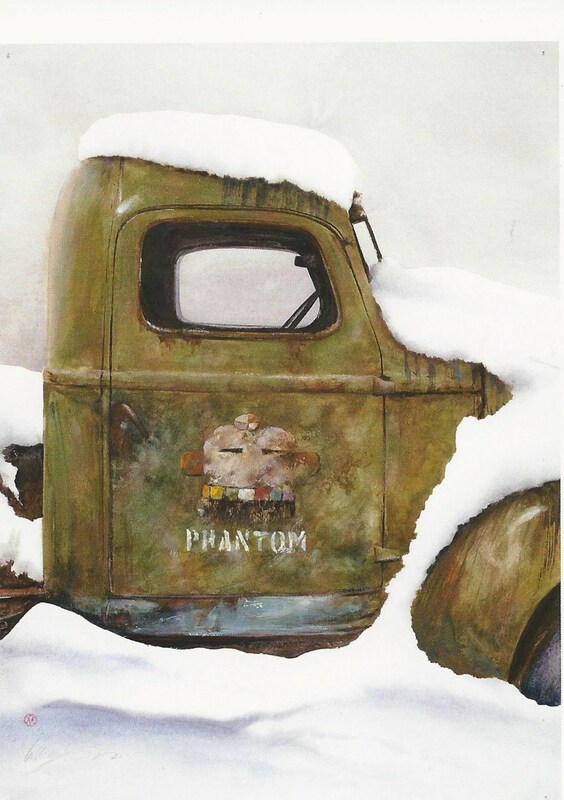 Lainey – I liked Proulx’s Bad Dirt collection best, and William Matthews art can be found online (google). I think he’s venturing into new territory as well. Thanks, always, for your interest. You’ve made me want to read her books. And omigoddess his paintings are amazing! A new artist! Yay! Thanks, Katie. I knew you’d like him! Just fabulous realistic detail – he makes these ranch hands come to life. I love reading YOU, Sammy! You’ve a gift yourself with the pen (so to speak). Thank you, Dale. So nice of you to show your appreciation. When I first traveled the west (by thumb, right out of high school), I was instantly taken with the vast, empty beauty. And forever hooked. Now that I live on its doorstep, my appreciation grows, but for the subtle details as much as the grandeur. Thanks for the insightful review…she sounds like someone I would appreciate spending time with. I think I’ll do just that. Curt, It grows more beautiful every year for me. Spring builds to summer then autumn comes in like a crescendo of prairie and foothills golds, rusts and reds. I truly feel like I live in God’s country. Of course then winter thrusts itself, unbid and unappreciated, but Annie writes such gritting stories about the vagaries of harsh winters that she gives them a romance all their own. Enjoy! Even through your scan, I could see the richness in that painting. Annie Proulx embodies all that is beautiful in the western story description, or any setting for that matter. Yes, a master at her art. Through her use of literary devices she can take the reader to the very place she describes in short order. Nothing ostentatious in her writing, just pure beauty. Thank you, Sammy, for presenting both artists so well. You said it well, Silvia. Both Proulx and Matthews capture the earthiness of our west in imaginative yet realistic artistry. It is amazing to me that the same author who wrote Shipping News (which I had a hard time starting, but LOVED it when I finally did) and Brokeback Mountain (as a short story) also wrote those evocative lines that you quoted in your post. I really need to give my library card a workout. 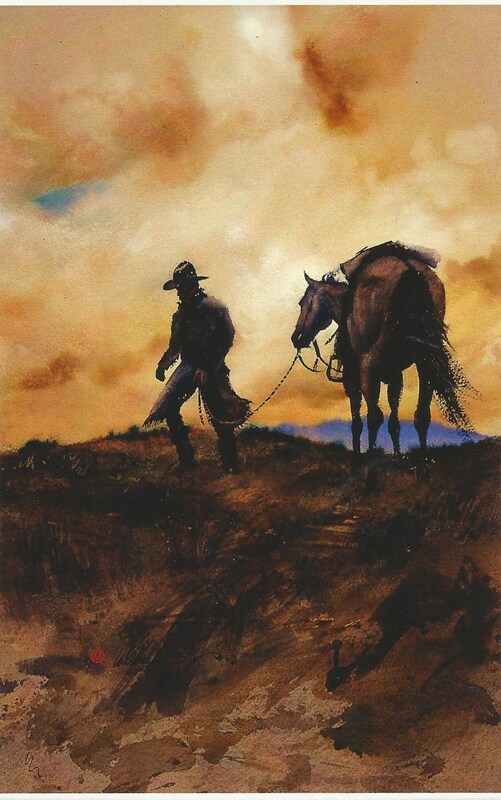 I’ve never been a big fan of western art, but I can certainly appreciate the artistry behind the images you shared. Thank you, Janis. I am flummoxed by writers who switch gears, but they aren’t any different than artists who explore new mediums. You can use that library card OR you can grab that unread copy of Desert Solitaire from your shelf and dive in without waiting for my review (in a couple weeks). Janis, I absolutely loved it – a virtual lovefest of nature and so prescient when Abbey wrote it. Speaking of artists who switch gears, do you remember the hubbub when Bob Dylan went electric? You would have thought the world had gone off its axis. Exactly! We resist change wherever it rears its head ! How funny, last night we were talking with friends about Annie Proulx. My friend was saying that she hated Shipping News and couldn’t finish it, but loved her short stories. From the extracts you have in your blog post I’m going to have to check out her short stories. I love her writing voice already! I, too, love the feeling of synchronicity that comes when finding connections. I have learned to listen to those signs! Oh yes. I think you can only love it when seeing it in person for several springs … The crackle of melting ice and trickle as rivulets begin their journey. Thanks, Jane! Thanks so much for the kind mention here.I’m delighted that I could introduce you to Butcher. 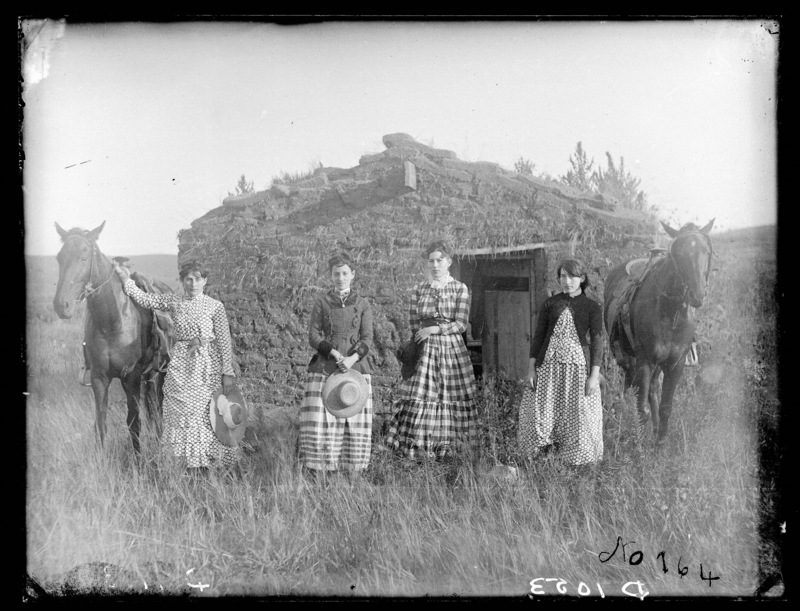 Some of my mother’s kin lived far out in western Nebraska, when soddies were the thing. I have a couple of studio portraits of them, but that’s all. A few went farther west, I believe, but most came back to the land of wooden houses with proper roofs. I didn’t realize you’re in Colorado. I’m sitting on several stories about my great-aunt Ina, who moved to Colorado and competed in the contest to write the Colorado state song. Some of the family said she won, but she clearly didn’t — unless there was one song, and then another, official one. I can’t remember the name of the man who wrote the song, but it clearly wasn’t Ina. It really is a terrible thing, to feel that business of “so little time.” At 68, it has less to do with hours in a day than with years left. I keep reminding myself to get busy! Thanks, Linda. Why oh why did I waste years chasing boys instead of history and great aunts and the magnificence of every single state in our country ?!? At this age I can’t chase anything and time is chasing me! You are so right ‘ there’s something about a truck’. My appreciation for Western art is growing as I broaden my reading and research of local history and the regional southwest. Bringing it down to actual terrain, locales, dates and photos guves me a better sense of which artists are telling stories with their art, and which are technically skilled but lack a Western heart. Matthews tells me a story with every painting. Can’t wait till you tell me Aunt Ina stories!